I’ve recently been playing around with making yoghurt, and thought I’d share my results here. My aim is to get you experimenting at home yourself! It’s easy, and good fun! Yoghurt is just milk which has been fermented by bacteria. 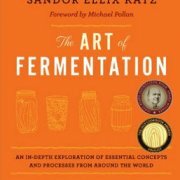 The process of fermentation ‘pre-digests’ the milk, reducing lactose content, and making it easier to digest. In the process, the milk thickens. The bacteria remain in the finished product, making it a ‘live’ food, good fro your digestion, immunity, and overall good health. You don’t need much equipment, but you will need a way of keeping your milk warm while it ferments. I’ve tried a few methods, and I really like the Easiyo yoghurt maker (see below for links) – It’s really nothing more than a specially designed thermos flask, but it’s super simple to use, and does the job marvelously. I don’t use the expensive Easiyo powdered sachets, but you can use their basic yoghurt making kit to make a more natural yoghurt, as described below. Failing that, any kind of insulating jar or container that you can fit a large yoghurt pot in will do the job. You can also buy electric yoghurt making machines, but I don’t think they’re really necessary. And the first time round, you’ll need a packet of dried yoghurt starter. You could try to use a spoonful of commercially bought yoghurt as your starter, but shop bough yoghurts tend to have fewer bacteria, and fewer different strains. You might find that your first batch of yoghurt works OK, but then if you try to use some of that first batch as a starter for your second batch, it may not work. 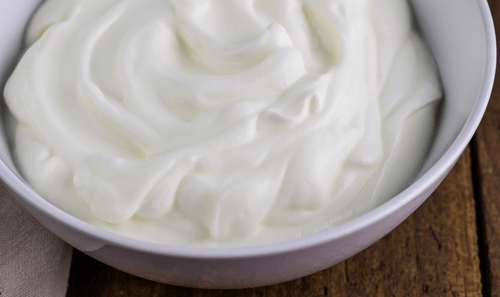 If instead you start off with a dried yoghurt starter, then you’ll be able to use each batch you make to start the next batch, continuing indefinitely – plus you get a much tastier finished product. Pour hot or boiling water into your Easiyo yoghurt maker / insulating container and empty yoghurt pot to warm them. Start with the best quality milk you can find. 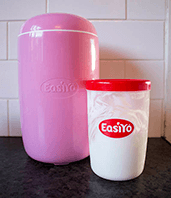 Full fat, organic and non-homogonized if possible (in the UK, I recommend Dutchy Originals, which fits the bill perfectly) – If you’re using the Easiyo yoghurt maker, you’ll need 1 litre. Heat milk gently in a saucepan, stirring occasionally to stop a skin forming, until it reaches 82ºC/180ºF – If you don’t have a thermometer, this is pretty much the point at which it would burn if you put your finger in it. It doesn’t matter if you heat a little higher than this. Turn off the heat, and allow the milk to cool. You can either just let it sit, or if you prefer you can place your pan in some cool or iced water to speed it up. If you have a thermometer, wait until it reaches 46ºC/115ºF, if not, just wait until it’s lukewarm but not completely cooled. 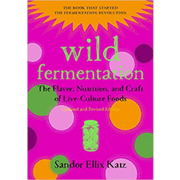 It’s important that the milk is not too hot, or it may kill the starter, but if it’s too cold the bacteria won’t get going fast enough for a satisfactory ferment. Once the temperature gets near, empty the water out of your yoghurt maker / insulating container and yoghurt pot. 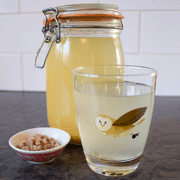 Refil the yoghurt maker / insulating jar with fresh boiled water. If using the Easiyo maker, fill up to the top of the red plastic insert, as indicated in the instructions. If using your own container, you want the boiling water to come roughly 3/4 of the way up the sides of the yoghurt pot, once it’s stood inside. If this is your first attempt, add your dried yoghurt starter to your milk. For subsequent batches, add 1 tbsp of your last batch of yoghurt per 1 ltr of milk. 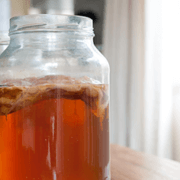 If you’re using a dried starter, it will take 12-24 hours to ferment. Check after 12, and if it hasn’t thickened, tip out the hot water and refresh with new boiling water to keep the temperature up, and give it a bit longer. 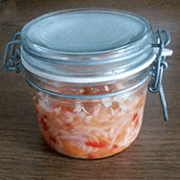 The longer you leave it fermenting, the more tangy the flavour will get, and the more the yoghurt will thicken. The yoghurt also gets gradually easier to digest, with more beneficial bacteria the longer you leave it, but to start with, don’t overdo it – not everyone enjoys the taste of long-fermented yoghurt. Once it has reached the desired consistency, transfer to the fridge. It will keep in the fridge for at least 2 weeks, probably longer.